Festival is one of my favorite comfort foods. The Jamaican festival is a popular street food that is often eaten with escovitch fish. It features a wide variety of spices and seasonings, depending on the cook. The dough is a mix of corn meal and all-purpose flour deep-fried in oil. 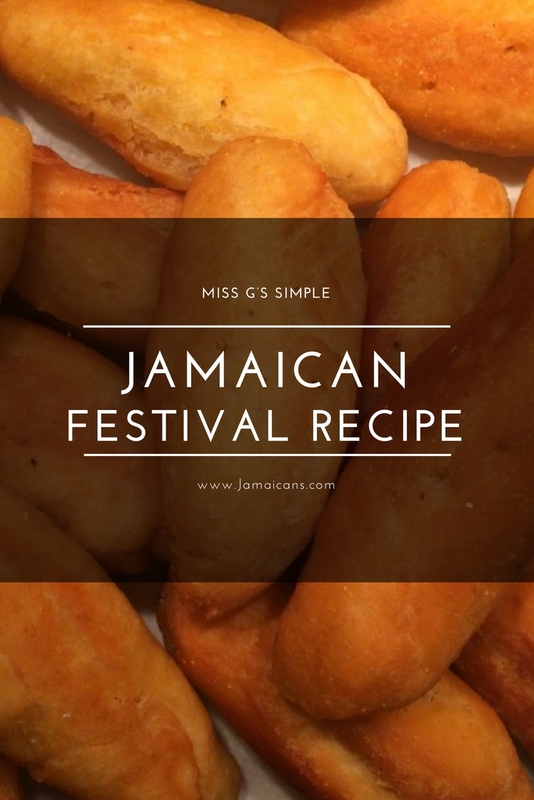 As any foodie knows, anything from the deep fryer is automatically heavenly, so try my Simple Jamaican Festival Recipe with the traditional vanilla flavoring or a choice of your own. Take a large mixing bowl and combine the all-purpose flour with the cornmeal. Add some sugar along with baking powder and salt. Mix well to combine. Beat an egg in this mixture and add vanilla to it. Mix them well together. Pour in some water and knead dough till it becomes smooth, while adding small amounts of water as necessary. Divide the dough in 6 equal sized pieces and prepare dumplings out of it shaping them lengthwise. Place a pan over medium flame and heat some oil in it, sufficient enough to deep-fry the dumplings. Once the oil becomes hot enough, put the dumplings in the pan, one after the other, and let them fry over reduced heat. Keep stirring them occasionally to ensure they are cooked from all the sides and have turned brown enough. It is ok for them to expand a bit while they are being cooked. Serve them hot with a side of your choice. In order to prepare a lighter version of these festival-dumplings, reduce the quantity of cornmeal to 3 tablespoons only and also adjust the water for binding the dough.